Combined Heat and Power (CHP) is the generation of electricity close to the point of use, often within the client’s premises and usually in parallel with the grid supply. Centralised power stations are relatively inefficient in terms of input fuel to electricity produced, with coal plant typically 38% and newer CCGT about 60%, meaning 40 to 60% of the fuel value is wasted. 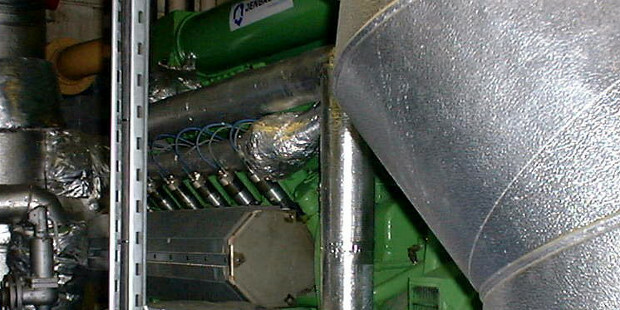 CHP recovers the waste heat to provide building, space or water heating, thereby displacing boiler fuel and providing considerable carbon savings. Some systems also use absorption chillers to provide cooling, also known as tri-generation, where the waste heat is used to provide process cooling water or for air conditioning applications. CHP works most effectively where there is reasonably constant base-load demand for heat over the 24 hour cycle, such as hospitals, swimming pools and some hotel and industrial facilities. Many schemes uses a heat network (district heating) to distribute heat to other buildings with mixed load profiles e.g. commercial and housing to increase the plant load base load and consequent carbon and cost savings. Such networks typically include conventional boilers for peak demand, or biomass boilers, geothermal heat etc. to offer further carbon savings. Once the network is installed, it allows future low carbon measures to be connected with relative ease. This technology is well established in mainland Europe, using a variety of fuels including energy from waste (e.g. Sheffield), Biomass with gas back-up (Barnsley, Newcastle etc) and fuel cells (Woking). Carbon savings can be considerable; e.g. in Sheffield the network serves over 140 buildings and saves 21,000 tonnes of carbon annually; Woking has in part led to an 82 per cent reduction in CO2 emissions from its stock.